SeizureGuard has been shown to improve a dog's ability to guard against seizures and their damaging after affects by building up essential immune systems, neurological systems, and the vital organs. Seizures Are Serious Business and Should Not Be Ignored! Did you know that Seizures can shorten your dog's life significantly? The good news is that SeizureGuard has been shown to improve a dog's ability to guard against seizures and their damaging after affects by building up essential immune systems, neurological systems, and the vital organs. When your dog's immune, neurological, kidney, circulatory, and defensive systems are not performing at their peak and ready to guard against seizures, permanent and lasting damage occurs after an epileptic attack. SeizureGuard helps to build up these systems to optimal levels. What Are Warning Signs Of A Seizure Attack? Overall body stiffness, circling around, agitated, excessive salivating, loss of consciousness, muscle twitching, tremors, leg shaking, uncontrolled urinating, un-expected bowl movement. There is no known cure for dog seizures. So if you dogs on medication prescribed by your veterinarian we advise that you NEVER discontinue medication, or replace a prescribed medication with SeizureGuard. SeizureGuard is a supplement to any prescribed medication by your veterinarian to build up vital systems in the event of an epileptic attack. So How Can SeizureGuard Help? By adding SeizureGuard Supplement to your dogs diet when a seizure does occur, the chances are good that it will be shorter and cause less damage. One of the most critical benefits of SeizureGuard is that, when a seizure occurs, your dog will be able to recovery will be faster. The recovery phase and time it takes to recover is where the most permanent damage and life threatening effects occur. SeizureGuard was Designed by veterinarians to be used in conjunction with prescribed medication. SeizureGuard Plus is an all natural ground breaking enzyme supplement you must keep your dogs on throughout its life to continue to build a strong immune system and help build his or her resistance to Epelictic Seizures. SeizureGuard rebalances and increases your dog's immune, neurological, kidney, circulatory, and defensive systems up to optimal performance. As a result your dog will be less likely to experience a seizure, and when a seizure does occur, chances are good that it will last shorter and cause less damage. And perhaps the most critical benefit of SeizureGuard is that, when a seizure does occur, your dog will be able to recover quickly from it. It is in this phase where most permanent damage and life threatening effects occur – when a dog cannot recovery from an epileptic attack. Designed by veterinarians to be used in conjunction with prescribed medication. What Are The Ingredients in SeizureGuard and How Do They Work? Chia Powder: Chia is a natural food source for added energy and endurance. High in omega-3 fatty acids Chia will help your dogs circulatory system and heart maintain peak levels needed in epileptic dogs. It also benefits a dog's joints after an attack, as well as supporting a healthy neurological and brain functions. It has a very high protective antioxidant value and is rich in vitamins, fiber and protein. Hemicellulase: Hemicellulase does a outstanding job at helping cells establish and maintain optimal sustainability levels. Hemicellulase also plays a vital role in cell tissue repair so vital after epilepsy in dogs. As it has such strong benefits to cell layers, it also helps dog's joints and muscles maintain pain free movement and flexibility. What Do Dog Owners Say About SeizureGuard? Barbara & Brad, Oakland CA. SeizureGuard works so good - we now have peace of mind knowing we are doing everything possible for our dog. His seizures have decreased and his mood is so good. Our veterinarian is confident he'll lead a long life. Thanks again! Don’t Forget That Our Lifespan Omega 3 & 6 Wild Alaskan Salmon Oil Can Help Too! LifeSpan Omega 3 & 6 Wild Alaskan Salmon Oil with CoQ10 is a great addition to further build up your dog's defensives against epileptic attacks. Causes of epilepsy in dogs is often related to deficiencies in omega-6 (linoleic acid) and omega-3 (alpha-linolenic acid). Studies show that a daily supply of these Omega Fatty Acids help build up the brains structural properties of the neoronal membrane, which is associated with dog seizures. Omega's and CoQ10 also improve circulation and immune responses after an attack. Call us today and tell us abour YOUR DOG! 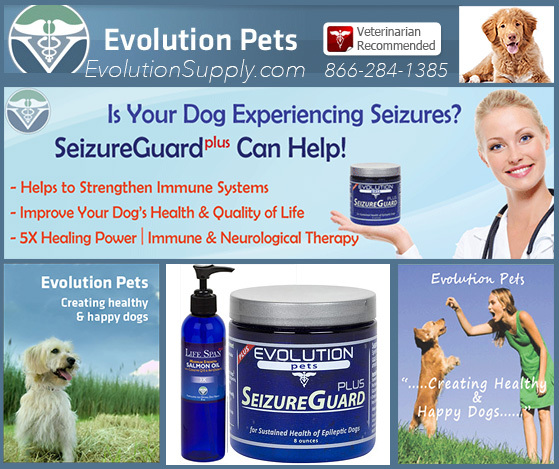 Call Evolution Supply and Tell Us About Your Dog’s Seizures Today and We Can Help! While nothing has been discovered to prevent a seizure, SeizureGuard is a tremendous help to dog owners. Each dog is a little different. We would like to talk to you about YOUR dog, his age, lifestyle and symptoms so we can get the right products, like SeizureGuard and Lifespan to help make a real difference in your dog’s life and well being.